Representatives, contractors and dealers can purchase premium kitchen ventilation products directly from Larkin Industries, Inc. 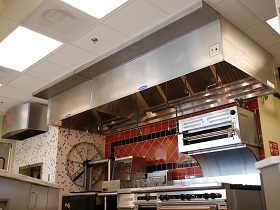 If you or your business is involved in the sale, design or service of commercial kitchen ventilation systems to an end user, Larkin Industries wants to partner with you on your next project. Our goal is to create a long-term relationship with our business partners by providing them with the highest level of customer service, quality products and the most competitive prices in the industry. Larkin Industries, Inc. chooses to work as a “no direct-sale” manufacturer. Unlike many other manufacturers in the industry, our goal is to be a valuable tool to our representatives, contractors and dealers. Larkin Industries, Inc. will not sell direct to your customers. We will work hard to make sure that your needs are met in a timely manner and we will always do business the right way to ensure a strong, long-lasting business partnership. Call a member of our customer support staff at 1-800-322-4036 and allow us to become your kitchen ventilation source. Larkin Industries, Inc. chooses to work as a “no direct-sale” manufacturer. Unlike many other manufacturers in the industry, our goal is to be a valuable tool to our representatives, contractors and dealers.